When it comes to the efficiency of smartphones, the importance of the processor (or SOC) usually takes priority. With the rapid advancement in the technology used in the manufacturing of processors, the modern day smartphones are capable of working at blazing fast speeds. In today’s article, we are talking about two important mid-range processors in 2019 to consider. 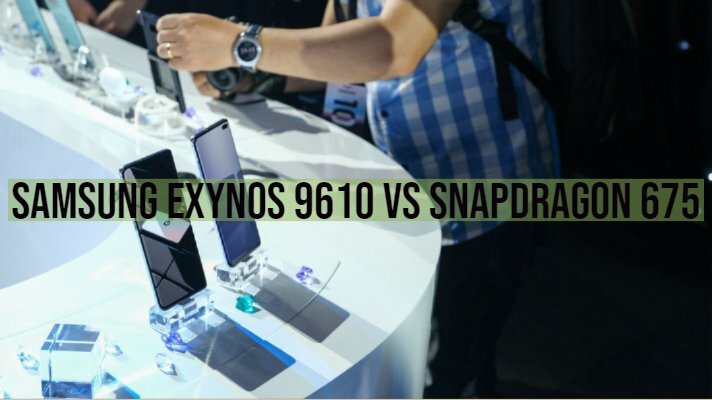 We are comparing Samsung Exynos 9610 vs Snapdragon 675. Read along to know more. The world’s second most popular mobile brand Samsung announced the mid-range Exynos 9610 Mobile platform 4 months ago. In order for smartphones to deliver outstanding mobile photography experiences, the Samsung Exynos 9610 mobile processor comes with a superior ISP. The Exynos 9610 is essentially an octa-core mobile processor that is built on a 10nm FinFET process. This processor is the foremost in the Exynos 7 Series to implement the cutting-edge 10nm FinFET lithography process to deliver enhanced performance with excellent power efficiency. With a view to present quick and flawless mobile experiences, this mobile processor depicts an LTE modem and excellent wireless connectivity. One of the key specialties of this mobile processor from Exynos 7 Series is the ability to capture videos and images in stunning quality. To deliver enhanced photo capturing and filming experiences, the 9610 processor includes a dedicated vision image processing unit. This unit is aided by a dedicated NPU which uses deep-learning algorithms. Moreover, the unit comprises of a DSP (Digital Signal Processor) which efficiently transfers analog streams of video and images into a digital signal. Also, it includes a neural-network engine that inspects the objects, facial and background detection. With the assistance of a deep-learning based algorithm, the unit facilitates mobile devices to present AI based functionalities to offer excellent photography and filming. The users will attain DSLR-like photography experience through the convenience of their mobile device. Implementation of the advanced face detection technology allows the camera to analyze faces which are not facing forward. It also detects those faces that are partially enclosed with some objects. Through the help of its smart depth sensing capability, it is possible to capture bokeh or out-focused portraits from a single camera. At the output, you would find fantastic picture quality even in the dark. This is due to the cleverly merging multiple frames that allow the unit to increase the signal-to-noise ratio (SNR). 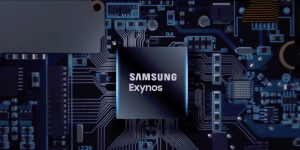 Inside the Exynos 9610 processor, there is the inclusion of the ARM Mali-G72 MP3 GPU that is based on a second-generation Bifrost architecture. This architecture facilitates a lifelike 3D graphics on your mobile devices. The included GPU provides support for the cutting-edge graphics APIs and different processing techniques including MSAA(Multi-Sample Anti-Aliasing). All these are dedicated to presenting great pragmatism while playing the latest mobile games. To make sure your mobile device is always stay connected, the 9610 processor incorporates an LTE modem. This modem supports 600Mbps for downlink with 3CA (Carrier Aggregation) whereas it supports 150Mbps for the uplink with 2CA. It packs in different connectivity features including the long range and faster Bluetooth 5.0 connection, high-throughput 802.11ac 2×2 MIMO Wi-Fi, faster, and FM radio. To present excellent global location positioning coverage, the processor comprises a 4-mode GNSS (Global Navigation Satellite System) receiver. It is known that the receiver contains GPS (Global Positioning System), BeiDou, GLONASS and Galileo. Seamless multitasking is offered through the octa-core CPU which includes four Cortex-A73 cores. These cores function at a maximum clock speed of up to 2.3GHz. This maximum clock speed is for performance-intensive tasks. For the light and typical tasks, the four Cortex-A53 cores operate at up to 1.6GHz. Now it is possible to capture outstanding moments in stunning detail with the use of the Snapdragon 675 mobile processor. The credit of the efficient operation goes to the multi-core Qualcomm® AI Engine that facilitates on-device interactions to an all new level. Compared to the previous generation, the Qualcomm Hexagon™ 685 DSP delivers 50% faster performance. Every on-screen gaming appears lifelike with the inclusion of the Qualcomm® Adreno™ 612 GPU which is made efficient with the aid of heterogeneous computing. You can capture images in great quality through the Qualcomm Spectra™ 250L ISP. Moreover, it slows it down with boundless 480 fps HD slo-mo recording. It is now straightforward to capture vivid memories through the Qualcomm Spectra 250L ISP camera module. This module is uniquely designed to snap marvelous detail in vibrant, true-to-life color. Moreover, this module supports advanced features like three camera support to capture super-wide images or to capture images up to 5x optical zoom. Also, it supports portrait mode and infinite HD slo-mo recording at a maximum rate of up to 480 fps (frames per second). The advanced Kryo 460 CPU which is based on Arm Cortex technology delivers a 20% enhancement in overall performance compared to the previous generation. This technology provokes powerful gaming experience and more efficient multitasking. The entire workload of this Snapdragon processor is balanced among 8 cores. Among these 8 cores, 6 efficiency cores are functional for day-to-day interactions, and there are 2 performance cores. With lower thermal envelops, it is possible to continue using your mobile device for the entire day through a single charge. 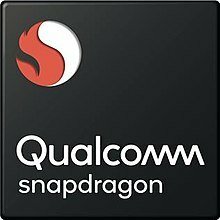 With the assistance of the multiple cores that work on the advanced artificial intelligence, it is found that the Qualcomm AI Engine provokes latest on-device interactions. These interactions are intended to deliver a smooth, smart user experience. It provides support for a powerful hardware and software ecosystem. Furthermore, it comes with the major AI frameworks that suggest that this platform is specially engineered to undertake the cutting-edge consumer oriented AI challenges. The Snapdragon X12 LTE Modem supports the maximum download speeds of up to 600 Mbps, and the maximum upload speeds of up to 150 Mbps. These speeds allow the user to get the desired content whenever and wherever they want. Remarkable connectivity is offered regardless of how sparse or congested the area is. Both the Samsung Exynos 9610 and Snapdragon 675 are dedicated to improving the performance of today’s mobile devices. The users will experience noticeable performance boost, both in terms of speed, efficiency and overall user experience of their devices.